On Friday, Amar G Bose, founder of Bose Corp., passed away in his sleep at his home in Wayland Massachusetts. Bose was 83. For most, the name Bose conjures up mental images of tiny cube-shaped speakers, frequent flyers with noise-cancelling headphones, and ads for table-top radios. But while Bose’s products are well-known, few are as familiar with the story behind the man whose name the company bears. 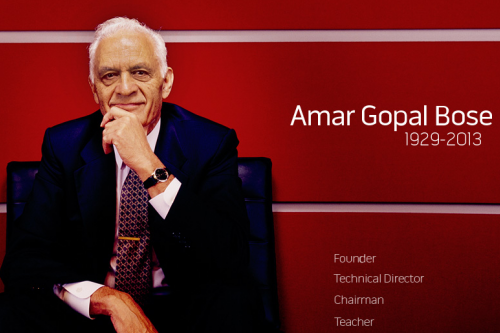 Amar Gopal Bose was born and raised in Philadelphia, PA. His father was an East Indian revolutionary who escaped prison and fled Calcutta, his mother American-born. During WWII, Bose’s father’s import business failed, leaving a 13-year old Amar as the primary breadwinner for the family. It was then that Bose’s penchant for tinkering with gadgets became more than a hobby. Bose worked with local electronic repair shops to help fix radios using a unique method that helped re-fuse broken filaments in vacuum tubes. After graduating high school, Bose scored a scholarship to attend MIT where he earned his Bachelor’s, Master’s and Ph.D. in electrical engineering. But his relationship with the university didn’t end there. He joined the faculty in 1956 and remained a professor there for 45 years before retiring in 2001. Ten years later, Bose gave a majority of Bose Corp’s stock to MIT in the form of non-voting shares, the dividends from which serve to sustain and further MIT’s mission in education and research. It was in 1968 that Dr. Bose founded the Bose Corporation. Apparently, the Dr. was let down by the sound quality he experienced from the stereo systems he purchased during his college years. As an avid fan of classical music, Bose was familiar with the sound experienced in concert halls. It was his belief that what was missing from home audio system was the indirect – or, reflected – sound experienced in the venues where music was performed live. Bose’s answer to this issue was his first speaker, the model 2201, which used 22 small midrange speakers aimed in multiple directions. The speaker was designed to be placed in a corner of the room and reflect sound from multiple points off of multiple surfaces. Unfortunately, the speaker was a flop. So, Bose dove into the deep end of psychoacoustics, a relatively fresh concept at the time. From that point forward, Bose Corporations mission (and tagline) has been “Better Sound Through Research.” This research would ultimately bear fruit in the form of noise-cancelling technology that would ultimately be adopted by the military, as well as the Bose “waveguide” technology, which enables compact speaker products to produce higher quantities of bass by routing sound through a labyrinth of channels or tubes. Today, Bose’s products remain some of the most recognizable audio equipment in the world. But it is Bose’s passion and dedication to scientific research in the area of acoustics that have had the greatest impact on society. Amar Bose is one of America’s great pioneers and, thanks to his dedication to MIT, his work will continue to bear fruit long after his passing.